Our marketplace of lenders will ensure you get the lowest rate available for your auto loans. Have your loan solidified prior to going to the dealership to save you time and money. Already have an auto loan? Do you have the best rate? In just a few minutes, you can probably improve your payment. RATES AS LOW AS 1.99%. Deserve a lower interest rate on your auto loan? Ready to lower your monthly payments? AUTOPAY can make it happen. We have an easy process and access to fantastic rates – you just need to apply. Find your rate. When it comes to financing a new car, it’s important to remember your options. With AUTOPAY you’ll be able to find a great rate while avoiding the headaches that often come with a vehicle purchase. AUTOPAY helps you finance a new car, or refinance your current car, by offering you the most favorable rates and car loan terms possible. We understand how difficult and frustrating it can be to find the financing you deserve when purchasing a new or used car. We also know how it feels to be saddled with a loan that has unfavorable terms. At AUTOPAY, our mission is to provide our customers with solutions that improve their financial situation. If you’re in the market for a new or used car, we can help you get the rate you truly deserve. And if you already have an auto loan we can help you find a better rate that lowers your payment. Let us work for you today! You aren’t going to be hassled and pushed to buy a car when you seek financing through AUTOPAY – we aren’t car salesmen, and we aren’t bankers. We’re car financing experts working to find the best possible car loan terms for you. We will put our financing experts to work finding the best possible terms for you. This way, you get to focus on finding the perfect car, or refinance one you already own. Whether you are planning on refinancing an existing car loan or buying a new or used car, AUTOPAY can save you money. Your interests always come first, and we will work diligently to find you the best rates available. When it comes to refinancing, AUTOPAY customers average savings of over $1000 each year and lower their APR by over 50%; a remarkable drop. For standard auto loans, we have many partners and are able to find fantastic rates! Ever been through the experience of buying a car? It often seems like it takes up at least a whole day, if not more. 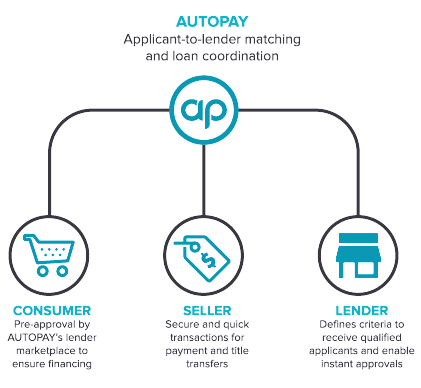 AUTOPAY streamlines this process while putting the power in the hands of our customers. When you show up to the dealership with financing already in place, you’ve got the confidence to get car you deserve for the best price possible. Getting a loan through AUTOPAY is fast, easy, and reliable! Taking an active role in your personal finances is a big step towards financial freedom. Sometimes things can be difficult when you aren’t given access to credit terms that your truly deserve. At AUTOPAY, we understand that things aren’t always perfect. We also believe in helping those who wish to have a positive impact on their financial futures. That’s why we work with people at all levels of the credit spectrum. At AUTOPAY, We do more than find you the perfect lender for your car loan or refinance. We also function as your virtual Finance & Insurance office, making sure that your best interests are protected every step of the way. As a consumer, navigating the process of closing on a new loan can be intimidating and time consuming. Let’s us step in and guide you along the way – we’ll be there from start to finish. "The whole process was simple and very easy to complete. I would recommend AUTOPAY to anyone looking for financing!"